Can money buy happiness? Is happiness a vat full of goo? Everyone knows by now that experiences, not things, make us happy. But what if you could pay your way into a simulated experience of limitless bliss? Defining money is easy. Defining happiness? Not so much. We've problematized modern money in this issue of MONTAG by trying to figure out what's next: credit, cryptocurrency, or capitalism's collapse. So for the purposes of this article, let's just call money "money," and assume the status quo: that money is necessary for survival, and can also be used to buy things purely for pleasurable purposes. 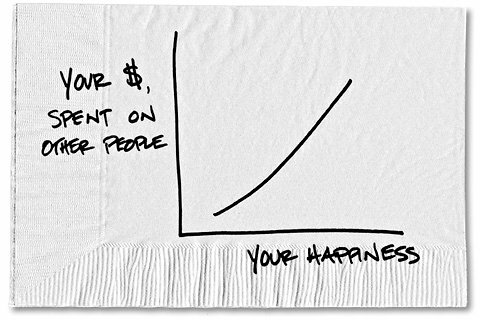 Most research into whether money can buy happiness says that once you've reached the point that the amount of money you have pays for your basic physiological and safety needs, the amount of happiness money can give plateaus. Researchers in 2006 measured the physiological response to charitable giving based on activity in a few areas of the brain: one of which is the orbitofrontal cortex, which has been linked to reward and hedonic pleasure (also known as happiness). The same area was monitored in a study of whether knowing wine is expensive increased consumers' enjoyment, and the answer was yes, people did have a stronger pleasure response to wine that they thought cost more money. So if you were looking for the short answer to whether money can buy happiness, it's affirmative. But why stop there, when through trying to answer this question we've figured out which parts of the brain manufacture the sensation we call happiness? Why not use technology to press that button as often as possible? The Experience Machine is a thought experiment by Robert Nozick that questions the limits of hedonism and asks exactly this question. In its simplest form, you can enter a simulation in which everything that can possibly make you happy happens. You choose the life you want to experience in a simulation while floating in a tank and unaware that you are living inside of the simulation, and there is no reason for you to exit it, except to potentially rotate the menu of experiences. Would you plug in? Most people, including Wait But Why's Tim Urban, say they wouldn't, because of existential FOMO: "I thought about the real world going on all around me while I lay unconscious in a vat forever, missing everything." Alan Watts tackles another aspect of this question in his Cosmic Drama: won't we get bored of everything in our simulated lives making us perfectly happy? "If our technology were to succeed completely, and everything were to be under our control, we should eventually say, 'We need a new button.' With all these control buttons, we always have to have a button labeled SURPRISE"
But there is an argument to be made for plugging in to the Experience Machine and embracing hedonism, as The Matrix's turncoat Cypher explains while enjoying juicy and delicious simulated steak. Even if you know it's simulated (which, in the thought experiment, you do not) there is no way not to enjoy it. Life is but a game? Simulated realities in science fiction ask us to question whether we would change everything about our experience of life if we could through technology. And with technological advances like virtual and augmented reality allowing for every day more lifelike, realistic simulations at our fingertips, how long will it be until we're faced with the choice of living in a technologically-mediated more perfect reality 24/7? The next logical step would be to connect the simulation directly to brain-computer interfaces where it can be launched at the press of a button without unwieldy headgear or screens. And at that point we might as well be in the vat. To return to Michael Norton and others' assertions that experiences are the one thing you can buy that are guaranteed to give you happiness, why exclude simulated experiences that aren't fully immersive, just immersive enough – like video games? Josh Taylor argues in "Why Robert Nozick Should Have Played More Video Games," that MMORPGs already allow users to participate in an Experience Machine of sorts, without the real-world FOMO or the lack of interpersonal interaction. While many inhabitants of Second Life, which still has over half a million regular users, are also constructing and living alternative lives within the game that they can engineer for maximum satisfaction. And technology will only get better – Linden Lab's VR portal Sansar is still in beta, but it's almost guaranteed that some people, if given the opportunity to live full time in a virtual world of their own creation, would choose it over living IRL. Full immersion in a virtual world designed just for you isn't exactly possible yet, but when it is (not if), the Experience Machine will no longer be purely a thought experiment: it'll be the most happiness money can buy.